AstroZoo, the Galaxy's premier tourist attraction, is in crisis! The animals are miserable and the visitors are staying away. Can you solve the oxygen, food and energy problems and make AstroZoo great again? 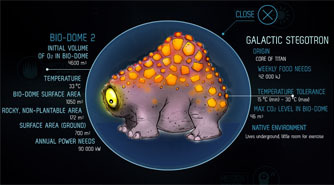 In the AstroZoo case study, pupils use computer software to try to save a space borne tourist attraction, AstroZoo, which has various exotic space creatures, but has fallen on hard times. The zoo was once a great success, but bad management has seen oxygen reserves exhausted, creature enclosures overpopulated, power supplies depleted and temperatures soaring. Pupils must use mathematics to discover how many creatures each dome can support with the available oxygen, find the right balance between food- and oxygen-producing plants, stabilise the temperature by optimising the numbers of power-producing panels and heat shields, and, finally, solve a predator/prey problem for a new dome. The pupils task is to try to find sustainable solutions for the creatures in each case so that they can do well - and so attract space tourists back to the zoo. To view the case study at its best, we recommend setting your screen resolution to 1280 x 1024 pixels. If your display does not support this resolution, or higher, we suggest that you run the application in full-screen mode: start AstroZoo then click on the Full Screen button near the top of the screen. Press the escape key to return to the normal screen layout. This case study provides opportunities for pupils to work on Key Concepts and Key Processes in the KS3 National Curriculum Programmes of Study. Pupils are expected to consider how mathematics is represented by identifying the mathematical aspects of the situation and selecting the mathematical information, methods and tools to use. They use the software to explore the effects of varying values and look for invariance, taking account of feedback to support them to work logically towards results and solutions. In reporting their outcomes to the Zoo managers, they consider the best way to present their findings. The AstroZoo case study supports 4-5 one hour lessons of classroom activity with the option for related homework activities. A mixture of whole class and small group work is involved. An interactive whiteboard or computer and data projector are essential for demonstration purposes. In keeping with the ethos of the Bowland approach, your role as teacher is to set pupils realistic targets, challenge pupils to think and reason for themselves and manage discussions and plenary reporting sessions. You should only demonstrate techniques as a last resort. Throughout, the goal is to develop pupils' ability to work and think independently. Preferably, each small group of pupils should have access to a computer running the AstroZoo software. Pupils will need calculators, graph paper, graphics calculators (optional), rulers, compasses, stiff card and squared paper. Each pupil, or pair of pupils, will need a printed copy of the resource sheets. Note: When printing PDF files, Please make sure that 'page scaling' is set to 'none', 'no scaling' or '100%' to ensure that diagrams are printed to scale.